It wasn't even what Air Corps veterans would have called a milk run; more like ferrying planes from one base to another. But for me it was a rumbling, roaring ride of a lifetime. We intercepted the B-17 Flying Fortress in Shreveport, La., where the Collings Foundation's Wings of Freedom Tour was wrapping up several days of public displays. A carload from Tyler's Historic Aviation Memorial Museum drove that morning to Barksdale Air Force Base, where we joined crews of three historic planes for the next leg of their journey to Tyler Pounds Regional Airport. 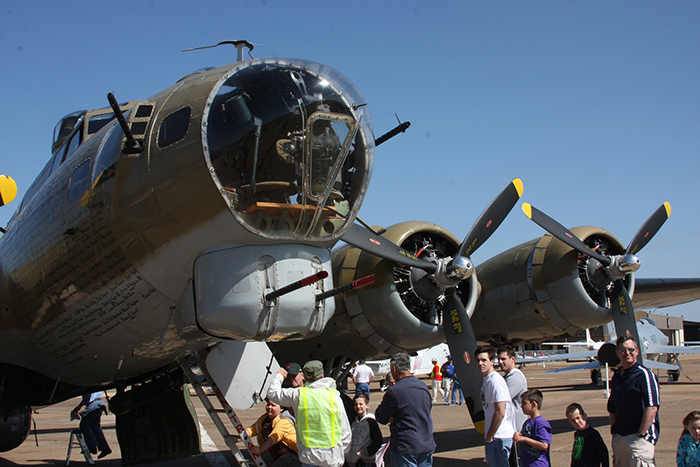 There, the World War II-era aircraft would go on public display through the weekend. After signing in and wolfing down a bite of lunch, our flight leaders alerted us it was time to board. Just two of us lined up next to the rear hatch of the B-17, sporting the name "Nine-O-Nine." Others boarded a B-24 Liberator bomber. Our leader clambered into the coveted rear seat of a shiny P-51 Mustang fighter. I was excited. The B-17 heavy bomber is one of those iconic planes that veterans seem to love. Former crewmembers speak of their planes in loving tones. Fighter pilots and B-24 veterans might tease or complain that the B-17 gets all the glory, but there is always respect when they talk about the damage a B-17 can sustain and still come home. The plane I was boarding had been untouched by war. Built just as the fighting was ending, it remained stateside, never making the long flight over the Atlantic or Pacific to carry men and bombs into battle. No matter. The 70-year-old aircraft had its own story, and proudly carried on the legacy of its famous namesake. That plane, the original "Nine-O-Nine," entered combat in April 1945 and completed 140 missions without an abort or losing a crewmember. It made 18 bomb runs to Berlin and dropped 562,000 pounds of bombs. Shot up, torn apart and blasted, by war's end it sported 600 patched holes. Still air-worthy, its crew delivered the old "Nine-O-Nine" safely back to the United States. With its battle finished, the old "Nine-O-Nine" along with thousands of other winged survivors of the air war, was unceremoniously assigned to the scrap heap to be stripped of aluminum and other valuable metals. The B-17 I pulled myself into that day never saw combat. For 40 years it sported a number, not a name. At first, it flew air-sea rescue patrols. Later, packed with instrumentation, its frame felt the concussion of three nuclear test blasts. After "cooling down" for 13 months, it was refitted to drop flame retardant on forest fires. The Collings Foundation acquired it in 1986 and restored it to its original wartime configuration. It was named the "Nine-O-Nine" to commemorate that other valiant plane that flew 140 missions without losing a man. Its perfect record didn't last. Just a year later, it crashed while landing during a Pennsylvania airshow. Despite extensive damage, it was lovingly restored and has since participated safely in 1,200 tour stops. It is one of only 10 B-17s still airworthy and capable of flying. Swinging up through the rear door, I entered a Spartan metal world with no creature comforts, just a frame with a thin metallic skin encasing whatever mechanics it required to stay in the air. 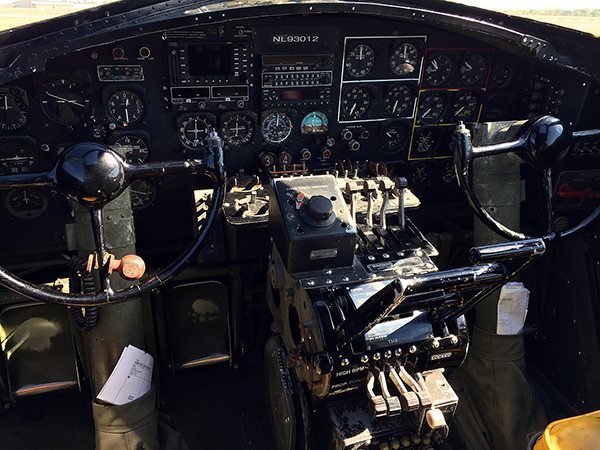 The flight engineer instructed me to buckle in, there on the floor below the left waist gunner position. A thin pad separated me from the cold metal deck. Once in the air, he said, I could unbuckle and move about, "just don't step onto the ball turret and be careful on the walkway above the bomb bay - and stay away from that rear door." OK, I thought, this is going to be interesting. From the belly of the plane, a sliver of sky was visible above the 50-caliber machineguns mounted on both sides. This is where waist gunners such as Willard Ward, of Palestine, and Carlton Josephson, father of a Tylerite, would have been stationed. Both were wounded, their planes destroyed, and both would spend the war as POWs. A piece of shrapnel lodged in Ward's chest would all his life be a daily reminder of the war. Somewhere forward, beyond the aluminum bulkhead, the pilot and co-pilot quietly performed pre-flight checks. Mechanical and hydraulic noises signaled tests of flaps and rudder and other things pilots check before leaving the safety of the ground. Soon, with a cough, a whine and a sputter, the first of the four 1,200-horsepower Wright-Cyclone engines began to turn - then roared to life. One by one, the others joined in a chorus of pounding pistons, churning propellers and choking exhaust. Exhale, hope for the best - and put your faith in the ground crew. During the war, men like George Pilgrim, of Tyler, a B-17 mechanic who sometimes flew along on missions to make sure his repairs held, and Bill Daughtry, of Gladewater, an armorer who filled the bomb bay with explosive ordnance and lugged hundreds of belts of 50-caliber ammunition to the B-17's 13 machineguns, kept America in the war. They patched the holes, serviced worn-out engines, cleaned out battle debris and returned the planes to the sky. And when - as often happened - their assigned crew failed to return, they prayed that some made it out, then packed personal effects and awaited the arrival from the states of another fresh-faced crew with their newly minted B-17. Aboard the "Nine-O-Nine," the four engines had settled into a steady roar. Eventually, the plane began to move, haltingly at first as the brakes released their grip, then more smoothly as the soft round bomber tires followed the pull of the propellers. Slowly, the big plane lumbered down the taxiway, its frame rattling with every rev of the engines. Turning at the end of the runway, the pilot brought the engines to full power, released the brakes and pushed the craft down the runway. Slowly it climbed into the sky. The roar of the engines made talk impossible, and I was ready to explore. Edging around the mechanics that controlled the ball turret, I marveled at the fortitude it must have taken to hang below the belly of that giant plane for up to a dozen hours waiting for waves of German fighters to attack. Ball turret gunners, like Jack Robinson, of Holly Lake Ranch, and Herman Molen, of Mabank, were survivors. Both, in separate planes, had been shot from the sky and locked up as German prisoners. Passing through the radio compartment, I popped up into the upper gun turret a vantage point atop the plane from which you can see in all directions. There are no live munitions in the bomb bay, just dummy bombs for show. Navigating carefully across a narrow walkway, you can either climb up into the cockpit with the pilot and co-pilot or duck down into the nose of the plane. I watched through the door, but left the pilots to their work. Even in peacetime, flying a big bomber takes a lot of work and all your attention. At first, it was difficult to imagine the men I had met, men now in their 80s and 90s, commanding these ungainly weapons of war. But as young men, they did. Men like Oran Ferrell, of Bullard, Howard "Pete" Peterson and Allen Thorndike, of Tyler, took off in the gloom and joined hundreds of planes, all flying straight and level in tight formations, heading for targets deep inside Germany. Moving toward the nose of the plane, I passed the navigator's desk, where Mike Sawall, of Bullard, Howard Fish, of Tyler, or Willard Pattridge, of Whitehouse, would have been busily scanning their charts, calculating time to target, estimating the rate of fuel usage and plotting the quickest and safest routes back to England. Even farther forward, in the nose of the plane, was my destination - the bombardier's seat. There, alone with my thoughts and my camera, ahead of the noise of the engines, I sat for an extended time over the bombsite, staring through the Plexiglas shield at the East Texas pine forests rolling by below. You are aware, really aware, that this is no ordinary seat, no ordinary plane, and that this ride today is not what the plane was designed to do. You imagine the men who once rode it into battle - many now gone with the passing of just a few years - and you try to imagine what it was like for them 70 years ago. Nineteen, 20, 21 years old, half a world away from home, cold and damp in the pre-dawn English countryside ... waiting for the signal that would launch them out over the English Channel into the dark. The bombardier, sitting where I sat in the vulnerable Plexiglas bubble, saw and heard it all, the maelstrom of exploding shells, careening planes and screaming bullets, the shouts and screams on the radio. He knew his chances of surviving the day were slim. Yet, when his time came to take control of the plane, put his eye to the bombsight and steer the plane to its target, he somehow put all that aside. Each member of those 10-man crews summoned up a level of courage that still amazes us today. They did their jobs; and the lucky ones came home. But many did not. More than 90,000 American airmen lost their lives in the air war over Europe. They died with their friends, in small numbers, in crews of 10. And the planes they loved and named and wielded as weapons of war died with them - 15,000 of them. This plane, this "Nine-O-Nine" that wanted to go overseas but rolled out of the factory just a little too late, this B-17 that sported the name of another, this bomber that never dropped a bomb or fired a shot - would, I think, have acquitted itself well. Dave Berry is the retired editor of the Tyler Morning Telegraph. This column was published Jan. 19, 2014. 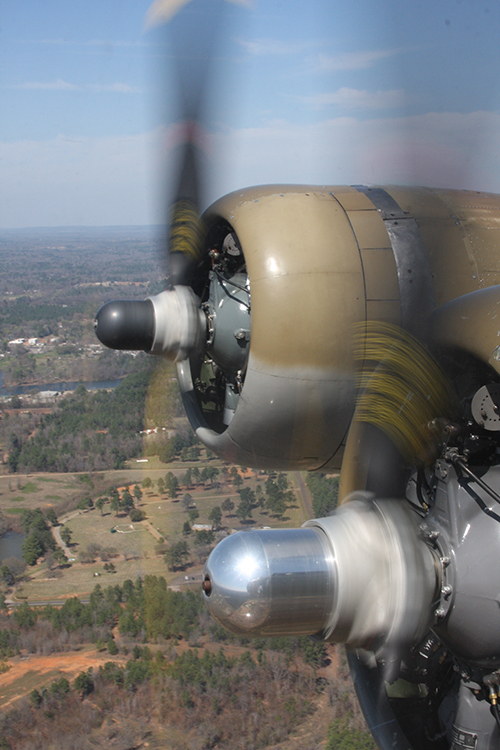 When the Collings Foundation schedules another Wings of Freedom Flight to Tyler, you should go. In the meantime, you owe yourself a visit to the Historic Aviation Memorial Museum at Tyler Pounds Regional Airport. Tell Lou, Chip, Marshall or Jerry I sent you.